To meet the market requirement, we have applied our years of experience and adopted technology from Europe and U.S to improve the NSK-294. We finally developed the NSK-393-3C three color automatic rotary soles jointing & ejecting machine. This machine has photoelectric digit control system which has three patents from the national Bureau of Standard, Taiwan; the system is not only easy to control, durable but also efficient. The special screw rod makes it easy to feed material evenly and speedily. It is also easy to change the color of materials. The computer synthesizes operation thus the machine works precisely. The joint of soles is excellent-no separation, no permeation of colors. High quality products increase ones market competitiveness. It produces three color sport shoes in one step to replace the former complicated procedures of lasting, gluing and sole attaching. It can use P.V.C., N.B.R., T.P.R. and P.U. The photoelectric digital control system with three patents divides the ejection quantity into sixteen sections, thus making the ejection precise. The machine is controlled by the computer. The computer controlled completely disc safe guards the system and ensures protecting of the molds. Molds shift automatically, therefore improving safety and reducing damages to the molds that might be caused by manual operation. Auto material passage clamping system reduces manpower and improves safety of the machine. The disc is driven by the hydraulic system with hydraulic brakes, which enables the disc to move steadily and position accurately. The hydraulic mold clamping system generates great clamping power without burrs and no permeation of colors. 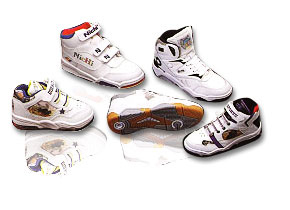 The height of molds is adjustable; it can produce sport shoes, canvas shoes, snow boots and safety boots. Feeding screw is running by the hydraulic motor, the machine works speedily, noiselessly and is breakdown free. Powerful ejection joins three colors of materials perfectly-no permeation of colors and great joint. The unique screw rod design makes it easy to change the color of materials without any left-overs. Last pulling and California pulling can be produced at the same time. Single-color, two-color, and three-color molds are suitable for this machine. Furthermore, this machine can produce single-color, two-color, and three-color, shoes simultaneously. The hydraulic system and electric circuit system are separated; it’s easy to maintain.